All Orders $50 or More! Lavender Lime began as a brick and mortar quilt shop located in Chattanooga, TN in 2005. In 2007 they began offering books and patterns under the Lavender Lime brand. In 2009, Better Homes and Gardens choose Lavender Lime as one of the Top 10 Quilt Shops in America. The shop closed in 2011 when Kathy began her career with Moda Fabrics (which she still has). Now Kathy has added a partner, her daughter-in-law Bekah and they still maintain the Book and Pattern business. 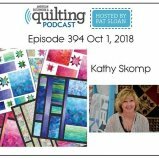 Listen as Kathy is a guest of American and Patchwork Quilting Podcast.